It's amazing how busy C and I have been while Hubby's been away! We've had an activity to do just about every day, including taking a Mother-daughter mini road trip, which was fun. Now I'm trying to get the house cleaned up before Hubby comes home and before my Mom arrives to take care of C while I go on a business trip. and I'll make some banana waffles and pancakes to freeze. Hopefully that will be enough variety to keep us from getting tired of banana! Hubby makes smoothies for us about once a week, and once it gets warm out, we'll start making some more popsicles. And speaking of recipes... I thought I'd share one that we used this week. I was flipping through a magazine and C saw an ad for granola bars, so naturally she asked if we could make some! Disclaimer: I'm very go-with-the-flow when it comes to granola bars. I toss in whatever I have in my cupboard, so the measurements are never exact! I usually add so many extra dry ingredients that I have to dump in extra honey to make it all stick together! 1/2 cup mini chocolate chips, dried fruit, nuts, etc. I always end up adding more. Some other things I often add are sunflower seeds, flax seeds, a sprinkle of oat bran and/or wheat germ, and crushed cereal left at the bottom of the bag (e.g. corn flakes, shreddies, etc.). Add all of the ingredients in a large bowl and mix together until combined. Press into a greased 9x9 pan (or a 9x13 for thinner bars). Bake at 350 degrees for 18-20 minutes. Cool for 10 minutes and score into bars. Let it set completely and then cut into bars. These chewy granola bars are really yummy. I always have a fair bit of crumbling when I try to get them out of the pan, but I save the crumbles to eat with yogurt. They keep well in the fridge, but remember to set them on the counter for a while before you eat them, to let them warm up; otherwise they're a bit hard on your teeth! I found this recipe on the Internet (somewhere!) about year ago, but didn't save the URL, so I can't credit the original source. "Yes, we have no bananas..." Actually, we have TONS! Help! My daughter loves the song "Yes, We Have No Bananas" by Louis Prima. We've been listening to the Jazz for Kids CD a lot lately. I have a ton of bananas in the freezer. Once they start to get mushy and spotty, I throw them in the freezer, intending to make banana bread. I've made a few loaves lately, but I still have a ton of bananas left. Do you have any yummy banana recipes to share? Help me clean out my freezer. Please! ... as I try to complete a report for work in my free time while Hubby is away for 11 days! I'm officially off work this week, but unofficially working towards the deadline. Laptop on the kitchen table, couch, and too many late nights! Whew - I need a rest! In preparation for our new baby, we recently changed our home office into an office/guest room, and that meant buying a smaller desk for the room. To ease the frustration of trying to figure out which cord belongs with which device, we labeled each cord before (or immediately after) disconnecting it. We just cut pieces of masking tape and folded them around the cords to make tags. Now we actually know what we're unplugging! It was also very helpful for computer cords that run between machines. 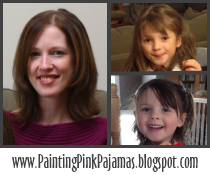 This post is part of Works-For-Me-Wednesday at We Are THAT Family. This one should be added to the Super Simple Activities posts! A couple of days ago C and I were listening to The Bowling Song by Raffi, and she announced that she wanted to bowl too! 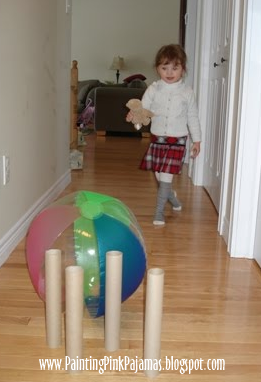 After some trial and error, we set up a bowling lane in our hallway. That's it - it can't get much easier! I closed the doors in our hallway so the ball wouldn't go astray. I started out using yogurt containers for pins, but they were too stable - I needed something wobblier. Since this was our first time, we used a beach ball, but I think we'll try a smaller Nerf ball next time. I need a few more paper towel tubes too. This short book has beautiful illustrations showing mother animals giving their babies kisses to show their love. It's perfect for babies, but at 3 years old my daughter still likes it (and the Mommy kisses that she gets while I read it)! Hands down, this has been our favourite daddy/daughter book. It's a sweet collection of poems showing the love and fun that men share with their daughters (a couple of them are pretty darn funny! The diaper changing poem is the best - C can even recite it!). This book makes a great baby shower or Father's Day gift. This book always makes me tear up! 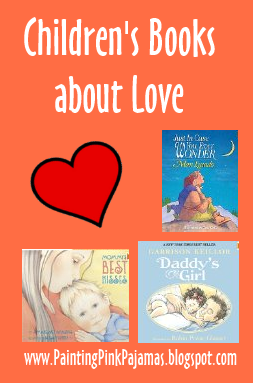 It's a beautiful book telling a child how God made them unique, and about how much their parents love and care for them. "...As you grow and change, some things will stay the same. I'll always love you. I'll always hug you. I'll always be on your side. And I want you to know that... just in case you ever wonder." Organizing all of those barrettes! Fact of life: when you have a little girl, you have barrettes. Teeny, tiny barrettes that always get lost. We don't have much wall or door space in C's room, and don't have room for a hanging barrette organizer (like this, this, or this one similar to what I had as a child). Instead, we just have a little barrette box that sits on a shelf, next to a little bucket of hair elastics. She has so many barrettes that it's a pain to search for a matching pair. I don't know why it didn't occur to me sooner, but now I've clipped all of the matching barrettes to each other, so that they're in the box in pairs. No more searching! Plus, I've removed all of the singles, and plan to make some felt barrette covers. Two child-related posts that made me cry. How to Handle Little People: A Parenting (Non) Tutorial. When You are Afraid of Dying. I've been thinking a lot about patience, and my increasing lack of it. Maybe it's the pregnancy, maybe it's having an almost-3 year old, maybe it's having so many deadlines and things to do lately... I've been feeling very much that I need to slow down and put aside some of my adult responsibilities, at least during C's waking hours, to enjoy the time with her, doing what she wants to do. "Would you like to play with me?" is heard a lot around here these days, and I probably put her off too much, wanting to get done the chore I'm in the middle of, first. But then I stop and remind myself: the dishes can wait, I can clean up later, the table doesn't really need to be cleared right now. She's already growing up so fast, and she's never going to be this age again. These are our last 3 months of having just one child, and as much as we'll love the new baby, I know I'll miss having so much undivided time with her. I need to enjoy, laugh, show her my unconditional love, and take a deep breath and have patience with the inevitable difficulties. I'm so blessed to have her in my life, and I don't want to take her for granted. So yes honey, I'd love to play, anything you want. C loves the baby doll that Santa brought her for Christmas. Polly goes everywhere with us, and gets fed, burped and changed almost as much as a real baby (practice for when our 2nd child arrives in May, I guess)! Soon after receiving her doll, I made a cloth diaper for Polly, because she is so small that real diapers went up almost to her chin! This week, C lost Polly's hairband, and was very distressed that Polly would have a cold head, so I also made a doll hat. Both garments were quick and easy; they just needed a bit of measuring to fit the doll I was working with. I used a scaled-down version of the pattern at Skip to my Lou, plus the suggestion from The Cottage Home to use more velcro to make it adjustable. I measured the doll's head, and used those measurements to transform an old, stained T-shirt of C's into a hat, using directions from the Rookie Moms. I have to dig out some newborn socks from our bins of baby clothes - Polly has been wearing C's toddler socks which are so huge that they don't stay on! I'm also currently making a stash of doll clothes for C's birthday this month, so stay tuned for more instructions and photos!